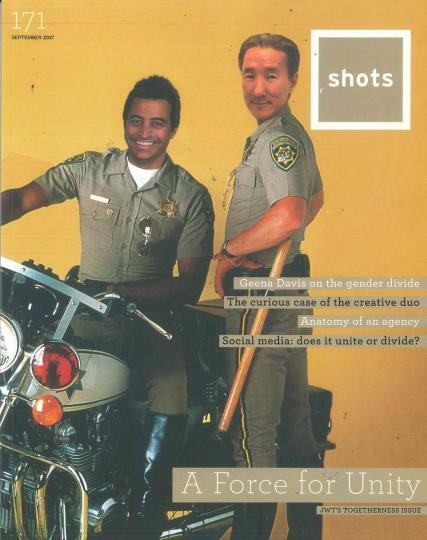 Shots magazine showcases cutting-edge creativity in global advertising. Shots magazine showcases cutting-edge creativity in global advertising. Launched in 1990, it is the world's leading commercials title, providing ideas and inspiration for creatives internationally – from clients and agencies to production companies and graphic designers – as well as being the foremost source of information for the industry. Shots selects only the most creatively excellent work including the most innovative TV commercials, the latest work from talented new directors as well as ground-breaking music videos, virals, short films and idents. The magazine includes director profiles, photographer profiles, print showcases, creative profiles and special features. Our country focus explores work created across the globe and our new directors feature reviews new and exciting talent. It's the ultimate one-stop creative research tool.